Accra, Feb. 3, GNA - A sizeable crowd awaits the Black Stars as Ghanaians based in Amsterdam are braving to ignore the biting cold weather to watch the senior national team battle Holland's first division side Ajax in an international friendly fixed for next Wednesday. 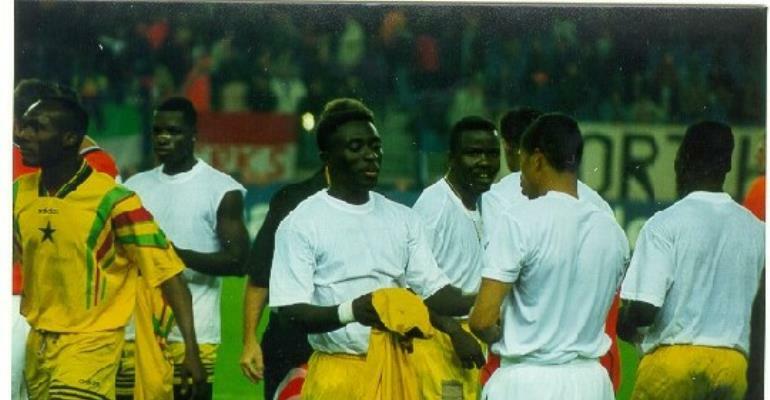 And in order to give the Ghanaians players, most of whom are foreign-based a befitting welcome, an Akan-speaking radio station situated in Amsterdam - Radio Akasanoma - has launched an aggressive programme to mobilise Ghanaians, particularly those resident in the Black Community called Balma, to cheer the boys throughout the game. The Ghana News Agency sources in Amsterdam say the Stars are expected to enjoy the support of other Africans based in Amsterdam because of the exploits of Anthony Obodia (Ajax), Christian Atta-Gyan (Feyeenord) and Matthew Amoah (Vitesse) who are respected by the Dutch people. It is the first major assignment for Serbian Ratomir Dujkovic ahead of an important World Cup date with the Democratic Republic of Congo on March 27. The coach told the GNA Sports that he was not enthused about a good result albeit, it could boost the morale of the boys. His aim is to let the match afford him the opportunity to assess the boys and possibly separate the men from the boys for future competitions. Dujkovic's convocation will be without deputy skipper Samuel Osei Kuffour who sought permission to attend to a family problem. Also likely to miss out are midfielder Michael Essien and striker Baffour Gyan who have been ruled out of the DR Congo match due to two yellow cards each they received in the previous games. The Stars travel to Kinshasa on March 27 hoping to register a win to topple group leaders South Africa who are a point richer than Ghana. Other countries in-group two are Burkina Faso, Uganda and Cape Verde. Some players who have regained call-up to the national team are former national under-17 skipper Godwin Attram, Hans Adu Sarpei and Dan Edusei.